Top rated Denver & Lakewood mortgage lender for over 15 years. 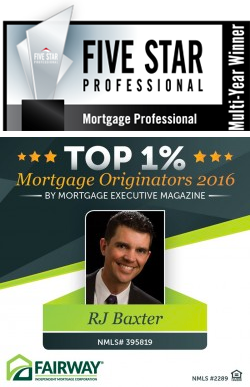 The RJ Baxter Team is proud of the level of service we provide to our clients and business partners. We value honesty, hard work, and responsiveness to your needs. We are known in the Denver marketplace for our high level of communication and follow up. Whether you are looking to buy a home or refinance, our team will help you navigate through the complicated home loan process. We know you don't do this every day like we do, so we use common sense and communicate with you in terminology that you will understand, not in complicated mortgage broker and real estate jargon. We treat every client like family, and strive to give you the best possible, stress-free mortgage experience. Call us any time...our team approach means that we are here to help you whether it's during the week, or on the evenings or weekend. Communication is our top priority! If you are looking to buy a home, we can get you a pre-approval letter quickly, and make the process fast and easy through our automated systems. If technology is a little overwhelming for you, don't worry, you are welcome to stop by the office and sit down with us. We have a wide array of loan products and low rates to help you with all of your mortgage needs. We are experts in down payment assistance loans such as CHFA, FHA loans and FHA streamline refinances, Jumbo loans, USDA Loans, and VA loans such as the VA IRRRL loan. If you are looking for a debt consolidation loan, want to get rid of your PMI, lower your payment, or pull cash out for any other reason, we can help. Just fill out our no obligation rate quote form for a free estimate. We also have extensive experience helping families buy a vacation home in Colorado. Not only that, but if you are looking to purchase an investment property up to 4 units, or tree removal services for building a new property on your new land, we can help with that too! Check out some of our online reviews to see what others are saying about Denver and Lockwood Loan officer RJ Baxter and his team! Call us or email for a complimentary, no obligation consultation....give The RJ Baxter Team a call today at 303-670-0137 or email us at baxterteam@fairwaymc.com! We have our Denver mortgage lender and Lakewood mortgage lender teams waiting for your call.